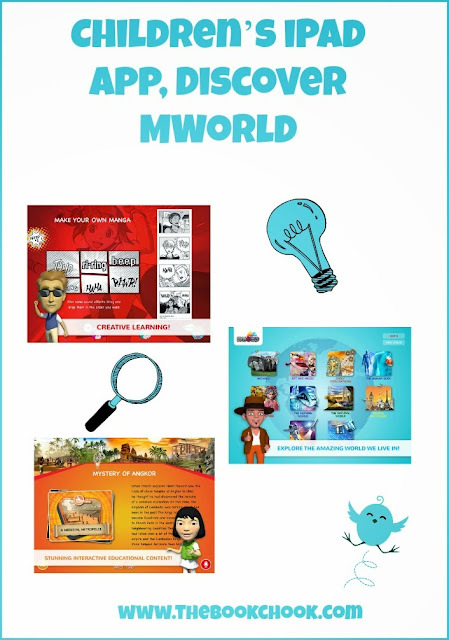 Discover MWorld is an Australian app for kids that provides a way in to some parts of the Australian Curriculum through exploration and interaction for kids of certain themes within its titles. It weaves AC content and skills throughout its titles, as well as Blooms Taxonomy, in the form of narrated scripts, videos, games, etc. So far there are 50 titles across a range of subjects. • Dozens of thrilling educational games and quizzes designed to captivate kids, reinforce knowledge and keep them coming back for more. • Age-appropriate, academic-reviewed text enhanced with superb multimedia features and stunning graphics. • Fifty subject titles to explore, covering all major branches of knowledge and with many more on the way. • A self-paced structure that ignites curiosity, rewards effort and emphasises in-depth learning. • The credible content that comes with an educational product proudly developed by one of the world's leading universities. • An open-ended educational game environment that encourages children to challenge themselves. • Comprehensive teacher guides to accompany each title and enhance the classroom learning experience. • Access to lesson planners and classroom accounts, as well as to the many teaching resources available at discovermworld.com/teachers. MWorld is simply the most amazing, engaging and original educational app you've ever seen. Whether you're a child or just a child at heart, MWorld has something for you. Consider it the new face of learning. Once you sign in, there’s a choice between customising your avatar and exploring. Exploration offers 10 subject areas like Art and Music, The Human, Body, Planets, People and Places. Each subject has different titles for kids to choose from. Here are the details of one learning pathway I followed. I tried Animals and chose Fangs - How Do Animals Eat. There was a short introductory video which posed questions to intrigue young watchers, and then I decided to learn about Carnivores. I read a short passage while I listened to it read aloud, and watched a video. All of these were in language kids could understand from about Grade 4 on at a guess. Next I chose an activity called Create Your Own Beast. Here I discovered I could earn 1500 MPoints if I could choose the right combination of features to create a deadly carnivore, a blood-sucking bat, a quick herbivore or a friendly dolphin. So we’re not just talking fun and creativity here, kids actually have to think about what they’ve read, watched and listened to earlier. There were many more topics I could pursue and all of them were perfectly targeted at children’s interest level. Topics with a gross factor like Eat your own poo! became definite learning opportunities! What I liked: I think the most impressive thing about this app is its immensity. There is just so much learning available. Content is not all on the app - once you pick a title, you need to wait a few seconds for that part to download. It works well and navigation is mostly obvious. I also really liked that someone with a sense of humour has contributed to the app. Kids will enjoy that too. It’s great that there are little pop-up quizzes, underlined words that lead to more detailed explanation, activities, games, crystal clear and stunning detailed photos, and that kids can proceed and learn the way they want. You can dip into the app here and there, or start where you want and cover all there is in that topic. Kids who find reading difficult are scaffolded by a warm and friendly Australian voice reading content aloud. Developers have also taken advantage of the gaming instinct that seems to be in most of us - the fact that kids can earn points during their explorations may be a motivator for them to keep reading and learning. I did have a slight problem with one activity: choosing items to decorate a bower bird’s nest. Great activity and appropriate for my learning about Animal behaviour, but I had trouble dragging and dropping the tiny objects. I am well prepared to believe this was the fault of fat fingers or an older iPad! It also seemed to me that navigation wasn’t crystal clear - going back a screen requires a left to right swipe, whereas I looked for an icon. This is something the developers are working on. When individuals buy the app, they get free access to three Discover MWorld titles: Volcanoes, Jammin' and Planets, and they get two credits so they can select two free titles of their choosing. After that, to unlock more titles, they need to purchase credits, which are around $1-2 each, depending on the number you buy. Schools, on the other hand, are subscription-based and that gives students free access to all titles. The video below gives you a taste of the app. I took ages to research and test Discover MWorld because there’s no doubt this is not a simple app. I did not test every title or topic, but I tried many and was very impressed with the quality of the app. It seems to me the business model of free titles so you can try it before you need to buy is a generous one. In fact, I commend Monash University for succeeding in such an ambitious and useful project, and suspect you’ll agree when you try Discover MWorld for yourself. Find the app on iTunes Australia. It does sound good but I have found the customer service so awful when I have asked a question that I'm going to bypass this one. If they can't help an adult with a question, what happens when my child wants to contact them. Very disappointed. I am really sorry to hear that, Cathy. They were fine in their dealings with me. I would definitely suggest you try again, and ask to speak to someone who can help you. Customer service is very important.